I have visited several magic towns in my travels in Mexico. On Wednesday I took a bus to Calvillo, about an hour away from the city of Aguascalientes. I discovered a colorful pueblo with friendly people. I spent hours strolling through the streets and shops, and visited two beautiful churches. The Plaza Principale was only a ten minute walk from the bus station. It was also adjacent to Parroquia del Senor del Salitre, a magnificent church. I wandered into the mercado and was surprised to find an escalator in this building. All mercados I’d been to previously in Mexico had stairs and ramps. On my walk to the museum I came across this colorful street as well as an amazing candy store. Unfortunately the museum was closed for renovations. All too soon it was time to leave this magical town and board the bus back to Aguascalientes. I don’t spend all my time in museums and churches. I do spend a fair amount of time outdoors. There is a lovely park about a away from where I’m staying, and it’s my favorite place to go when I want to color. I pack up my gel pens and coloring pages and enjoy it far more than coloring indoors. People are curious and I get into some interesting conversations. Just the other day I taught a little girl how to count up to ten in English. Parque Hidalgo is another park I visited a couple of weeks ago with my friend Iracema and her four-month-old son Ian. It goes without saying that there is an abundance of greenery due to the beautiful weather here in Aguascalientes. This park also has animals. Most are caged but some of the larger birds roam free. There is an amusement park area with rides for the children. My favorite part was the fountain area. I always find water calming. I was also delighted to see ducks swimming around in the pond. Another park Iracema took me to was Rodolfo Landeros. This park was huge and I intend to go back there. This time I will rent a motorized golf cart as it was impossible to see everything in one day only walking. Bicycles are also popular rentals here. We came across a beautiful lake with an abundance of swans, geese and ducks. I even got a close up of one of these beautiful creatures. As much as I would have liked to sit there all day and meditate by the water, there were other places to see in the park. We climbed up a flight of stairs to the top of a hill where we had a magnificent view of the park and the lake below. We actually did stay there for a while admiring the view. We continued our walk and came across some animals. Unfortunately the aviary was closed. Apparently one of the animals had gotten loose and had feasted on the birds that were non-flyers. Only a handful of birds perched up high were safe that day. Our final stop was Cabana Juan Chavez, home of the Mexican equivalent of Robin Hood. This is not a place for anyone with vertigo. I have climbed pyramids, explored underground caves and mines. And I can now say I have experienced the Cabana. I am thankful for the guard rails but not so thankful for the slippery black stones. On our way back to the car, we passed by an area with trains and other animals. There is also a miniature city here and paddleboats. But these areas will have to wait for my next visit. I am definitely going back to this park! It was a somewhat cool and cloudy day when I took an Uber out to Plaza de las Tres Centurias to explore a train museum. 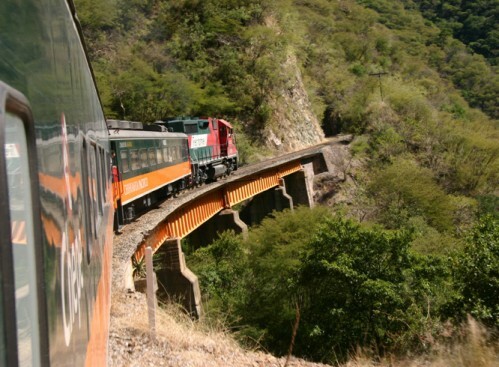 I’d never been to a train museum before that had focused on railroad travel and the history behind it in Mexico, and this museum did not disappoint. What surprises me is the number of locals I’ve talked to who have never come to this museum before. Then again many have not gone to some of the other museums in this city either. This is a train museum. However one of the highlights has absolutely nothing to do with trains. The fuentes danzarinas (dancing fountains) was a delightful display of water combined with music. It is presented hourly throughout the day and lasts about 15 minutes. I actually watched it twice! The museum itself features displays in separate buildings. Admission is a mere 5 pesos and is free to seniors with an Inapam card. Each building had interesting displays, vintage items and photographs. Outside there are a number of brightly painted railway cars along the tracks. There is even a miniature train that features a ride around the park area. There is also a garden area with a few statues of railroad pioneers. There is also a small ice cream shop as well as a quaint cafe featuring a variety of coffees and snacks. I highly recommend a visit to this unique museum in Aguascalientes. Aguascalientes is an exciting city with a treasure of museums, churches and parks to explore. I had originally intended to stay for one month. I am now into my second month and still have a list of places I want to go and things I want to do. Last Thursday I decided to check out the Altaria Mall instead of my usual exploring. A 20 minute Uber ride and I felt like I was in an entirely different world. I’m staying in Las Flores which is a typical Mexican neighborhood. The Altaria Mall is like any American mall and has many of the chain stores such as Bershka, Pull and Bear, Radio Shack, Starbucks and more. One of the flagship stores is Sears, so I now feel like I am in Mexico as Sears has all but vanished in the USA and Canada. The other main department store is Liverpool. As I strolled through the mall, I was amused to see that Liverpool was selling Krispy Kreme donuts. I selected a Boston Cream but was disappointed and realized how much I missed Tim Horton’s in Canada. I walked by ComicX and I recalled fond memories of the one in Mazatlan where I often went with friends. I couldn’t help but snap photos of these lovable characters. Hours later I found myself back in an Uber headed for home. Along the way we passed a tienguis close to where I was staying. I traded my sandals for track shoes and headed back out. This tienguis was primarily fruits and vegetables with only a smattering of other items. It was much smaller than the one I used to frequent in Tlaquepaque. I was enchanted by the birds in cages and of course enjoyed the people-watching. That was my shopping day…….from one extreme to another.